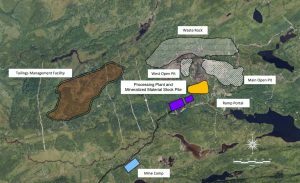 QUEBEC – Toronto-based Eastmain Resources says the preliminary economic assessment for its Eau Claire gold project in the James Bay region points to a pre-production capex of $175 million. That would see the development of both an open pit and an underground mine. At an average mining and processing rate of 1,500 t/d and gold recoveries of 95%, the project would have average annual production of 79,200 oz. of gold or 951,000 oz. over the life of the mine. Thus far, the property has total measured and indicated resources of 4.3 million tonnes grading 6.18 g/t gold for 853,000 contained oz. The inferred portion is 2.4 million tonnes averaging 6.53 g/t for 500,000 contained oz. About 1.6 million tonnes at 3.78 g/t gold are recoverable with open pit methods and about 4.8 million tonnes at 5.24 g/t are recoverable from underground. Details of the Eau Claire (Clearwater) project are available at www.Eastmain.com.